Thanks to the recovery work being done by the Archaeological Sovrintendenza of Naples and Caserta and the contribution of the Commune of Naples, a first nucleus of the huge Pausilypon archaeological site has been permanently reopened to the public. This with the help of staff of the Commune, helpers and the cooperation of members. The fascinating tour begins at the entrance at the end of Coroglio descent, where the magnificant Grotta di Seiano begins. This is a man-made tunnel whose 770 metres run through the tuffaceous hill of Posillipo, connecting the area of Bagnoli and the Flegreaen Fields with the Gaiola deep valley. This ancient passageway, which was dug out about two thousand years ago and reinforced in the Bourbon period, snakes through the fascinating half-light of the tunnel and then is struck towards the end by the blinding light from side underground passages on the steep coves, which offer a breathtaking view. Beyond the cavern, we take a path lined with typical Mediterranean vegetation and come to the area of the villa to which Vedio Pollione, a wealthy Roman knight to Ottaviano Agusto, gave a name of Greek derivation, "Pausilypon", or "place which stops all the cares" in order to describe the spell and the beauty of this place called Posillipo. The villa is adaptable to different circumstances, and was enlarged to satisfy the needs of an imperial residence whose full extent will be discovered only when the Archeological Sovrintendenza will complete the work with the final aim of opening this archeological site of Pausilypon to the public. There are remarkable archaeological remains in this area - a theatre of splendid structure with 13 rows of seats in the top auditorium and 6 in the middle one, an overall seating capacity of two thousand which exploited the natural slope of the hill, in accordance with the typical technique of Greek amphitheatres. On the opposite side are the remains of the Odeion, the ancient roofed theatre used for recitals of rhetorical poetry and musical performances, which has a small "cavea" or auditorium positioned in front of the large Theatre. given to the imperial domain after the death of Vedio Pollione(15 AD). given to the imperial domain after the death of Vedio Pollione (15 AD). The archeological site is open to the public every week from Monday to Saturday. Visits are by booking only. Phone number: 081/2301030. On Mondays, Wednesdays and Fridays, access can be had only to the Grotta di Seiano. 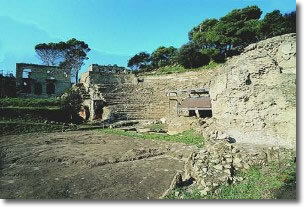 On Tuesdays, Thursdays and Saturdays, the tour includes both the grotta (cavern) and the theatre area. From 9.30 am to 11.45 am. Average duration of a visit to the whole area is about one hour. Exit from the tangenziale bypass Fuorigrotta - Via Diocleziano - Piazza Bagnoli - Salita Coroglio - Grotta di Seiano. Exit from the tangenziale bypass Agnano - Via Agnano - Vi Beccatelli - Via Nuova Agnano - Piazza Bagnoli - Via Coroglio - Salita Coroglio - Grotta di Seiano. C21, C27, C31, 14br, 44, 11. The F9 bus stops outside the entrance to the archeological site.